Here you’ll learn to make fishing lures, adding another dimension of fulfillment to your fishing experience! Our plan is to offer advice, materials, and tools so you can tie your own Buggs and experience the same enjoyment as we do. There’s just nothing like catching a fish on a jig or fly you’ve tied yourself! Thanks for your patience as we gradually work the plan. Speaking of the plan, if you read this page and see that we’re missing something, please let us know. We truly listen to our customers and try to provide the best advice possible. Buy What You Need Here! When you’re ready to make fishing lures, you always start with the heads. Since the beginning we’ve gotten requests for our jig heads. So it’s a no brainer to offer them, and they’re first on the list. The Buggs Original Jig Heads are the sames ones we use on the Curl-Tail Jigs, Double Bunny Jigs, and Beastie Buggs. They’re made right here in the USA and feature super sharp, super strong Mustad hooks. You can think of them as perfect shallow water saltwater jig heads. When we introduced the Curl-Tail Jigs and Double Bunny Jigs back in 2010, a lot of our customers saw the similarities to bonefish jigs. They took them to the flats but reported back to us that the hooks were too big for small and medium sized bonefish. Well, we listened and a couple years later began offering downsized versions of our original jigs heads, perfect for bonefish! In 2014 we introduced a Swim Jig called a Hydra Bugg. This jig features a completely new and original jig head with lots of interesting features. To make fishing lures you start with the heads but then you have to decide what to tie onto the hook and figure out how it’s getting on there. That’s what we’ll talk about here. We’re committed to providing all of the materials you need, and we’re going to tell you how to use them. Fly Tying Thread is what holds materials to the hooks and is essential for making fishing lures. We wrote an article about the absolute best thread for Buggs and larger saltwater and warmwater flies. After Rabbit Strips, there’s a whole host of other materials involved to make fishing lures. For the purpose of Buggs the main materials are krystal flash, chenille, and silicone legs. We’re working on the krystal flash article, but in the meantime we’ve already added flash and chenille to the online store. 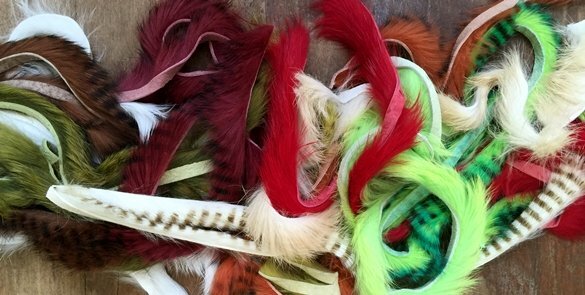 We mentioned silicone legs above, but in most fly tying circles they’re known as Crazy Legs. Why are they important and where do I find them? I’m glad you asked! Learn about the three main reasons we use them, and see the huge color selection by following the link below! We’ll be adding more materials and content so stay tuned! Soon you’ll find all the advice and every material you need to make fishing lures. I know we’re still missing some things. What else would you like for us to offer? Be sure and drop us a line and let us know – Head to the Contact page now! And if you want to be the first to know when the instructions and materials are available, sign up for our newsletter! Thanks for visiting this page. We can’t wait to share more materials and advice with you so you can experience the thrill of catching a fish on a hand-tied Bugg of your own!